George Billis Gallery is pleased to announce Verdant, a solo exhibition of paintings by artist Daniel Phill. The exhibition will feature recent work by the artist in his abstract expressionist style. The exhibition runs from May 21 to June 25, 2016, with an artist reception on the night of the 21st. Since the George Billis Gallery started exhibiting his work in 2002, Daniel Phill has transformed, recreated, reimagined, and evolved his unique style of blurring the boundaries of abstraction and representation. Known mostly for his botanical imagery, his paintings bear his signature bold strokes and improvised gestures and marks that are created and composed on layers upon layers of thick, wet, viscous paint on canvas. First and foremost a colorist, Phill creates fiery, saturated hues. He pieces together organic shapes in his abstractions and teases images from splatters of paint in his botanical paintings. In each painting, the artist’s use of color dramatizes the illusion of space and light to produce an ambiance full of both energy and serenity. Phill’s canvases demonstrate an impressive control of his material. 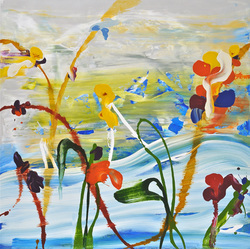 In large, loose gestures, he describes essential details - long, slender tendrils become reeds, pressed and flattened globs of paint turn into petals, and delicate veins emerge from colors bleeding together. Plants, flowers and vegetation appear and vanish into the picture plane, often submerged under layers of pigment and washes. A fluid application of paint, using non-traditional painting tools, contributes to achieve results which are intensely colorful and often sensuous. Phill was born and raised in Washington State. He received his MFA from Stanford University and his BFA from San Francisco Art Institute. Daniel Phill has exhibited nationally and is in diverse public and private collections. Phill's paintings have been reviewed or published in: ARTnews; Art in America; New York Sun; California Home+Design; New Yorker; Los Angeles Times; Art & Antiques; Who's Who in the West; and Artweek, among others. He currently lives and works in San Francisco.